The map highlights extinct flora, fauna, and landmarks. In front of Oakland City Hall, transported from Mosswood Park a century ago, the Jack London Oak Tree stands in Frank Ogawa Plaza. Its sister oak trees can be found in the logos on street signs, T-shirts, and jewelry, and dotting the landscape in a few parks around town. The live oak tree's status as a beloved symbol of Oakland overshadows its actual scarcity in a town once so full of them that Spanish and American colonizers named the city for them. How does that happen and where did they go? Liam O'Donoghue might have a few answers. O'Donoghue is the founder and host of the East Bay Yesterday podcast. Started in 2016, the podcast features stories from elders, historians, and current and former East Bay residents. It covers the people, places, and cultures of times gone by. In a little over a year, he has cultivated an engaged community of fans who listen, comment, and share or direct him to stories of life in Alameda and Contra Costa counties. As rents rise and elders face eviction, people, places, and things seem to vanish, taking their histories with them. When it comes to local history in the Bay Area, there is a clear sense of urgency right now. An avid explorer, O'Donoghue has become a sort of preservationist, walking the city and photographing disused buildings, sometimes capturing them right before their pending demolition. Thanks to this habit, he has become a repository of not only stories, but images, too. "Most of the stories I'm interested in revolve around people," he said. "And I'm fascinated by architecture and infrastructure, but those things don't necessarily lend themselves to the audio format." O'Donoghue shared his images online and people loved them, but he was sure there was more that he could do with them. So he joined friend and Oakland-based illustrator T.L. Simons to come up with the best way to present this visual information. The pair wanted to confront the disorientation of living in a rapidly changing city, to find a still point from which they and others could orient themselves. What they came up with was Long Lost Oakland. 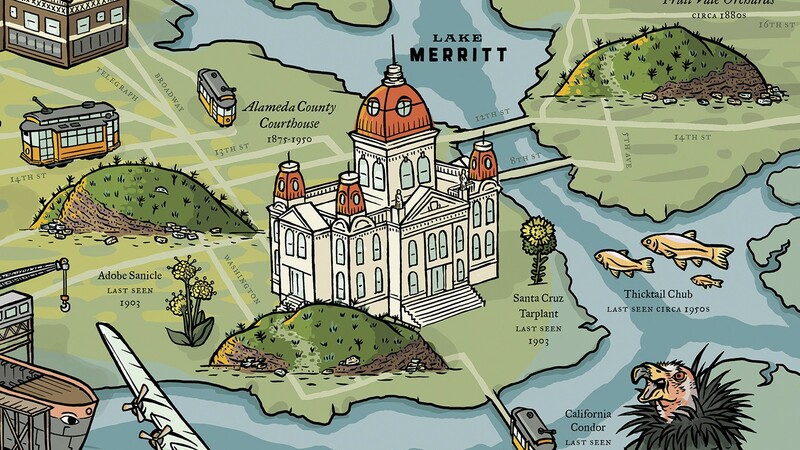 Long Lost Oakland is a podcast mini-series, a series of free events, a walking tour, and a hand-illustrated map highlighting vanishing and extinct flora, fauna, buildings, and businesses in Oakland from the 19th and 20th centuries. In Long Lost Oakland, oak groves blossom in the west, salmon swim the shores, grizzlies roam the hills, and California condors nest in old-growth redwoods in the east. After hundreds of hours of work over the last seven months, O'Donoghue and Simons launched a Kickstarter campaign to support their project, quickly exceeding their $10,000 fundraising goal. Besides being a charming representation of times past, Long Lost Oakland is also a fastidious collection of local historical scholarship. O'Donoghue treats history as an ongoing conversation, building on prior generations of historians like Beth Bagwell, author of Oakland: Story of a City, and Oakland journalist Delilah Beasley, the first Black newspaper columnist in America. "The goal is that this map is one part of the conversation and that other people will build on it," said O'Donoghue. Aided by the local historians who maintain the Oakland Wiki and by the librarians in the Oakland History Room, O'Donoghue was able to compile this iteration of Oakland's historical record. Simons brought that history to life in their imaginative illustrations. Fans of the map range from elementary and high school teachers interested in using it as a learning tool to nostalgic residents in senior centers. As a part of the project, O'Donoghue gives presentations around the East Bay. Delving into the history of disenfranchisement and the powerful businesses that changed Oakland, he connects the past to the present to make the map take on a sort of four-dimensional view of the city. There are three key points from which to orient yourself on the map: the shoreline, where the land meets the bay, the Ohlone shellmounds, sacred burial land, and the key system, the original mass transit system that connected the entire East Bay. It is radical — "in the sense that radical means getting to the root of something, looking at the root causes of the changes that we see now," said Simons. "This map is a way of remembering and tracking these various massive transformations that have shaped the city that we're in now and understanding the current transformations in the context of past transformations." Using surveyor maps from the 1800s and data collected by Caltrans after the collapse of the Cypress Freeway, Simons and O'Donoghue traced the original shoreline and marked the approximate locations of the known Ohlone shellmounds. To spend time with the map is to confront a legacy of displacement and industrialization that has destroyed so much. The old-growth redwoods are gone because they were over-logged; the oak groves were felled to make way for paved roads. The manufacturing boom that brought people to the city, settling in West Oakland and extending the shoreline, also polluted the waters at the port. And the non-native species brought in on ships swept through the estuary and crowded out the native crawfish in Lake Merritt. Our history is a history of loss and it's right there on the map. What the project asks of you is to participate, think, imagine, and remember. If you can stand in the present and recognize yourself as a part of history, guided by the lessons of the past and acting as an agent of the future, maybe you can make better changes. "We're trying to show the consistent patterns that emerge through constant change in our city," said Simons. "We have the agency to potentially shape what those changes are moving forward."